And so we continue the story of famous youtube mp3 sites going down… Sad news, the site I’ve been admiring so much recently – TheYouMp3 doesn’t work anymore. These news come just few months after Offliberty stopped working and later youtube-mp3.org has gone down. 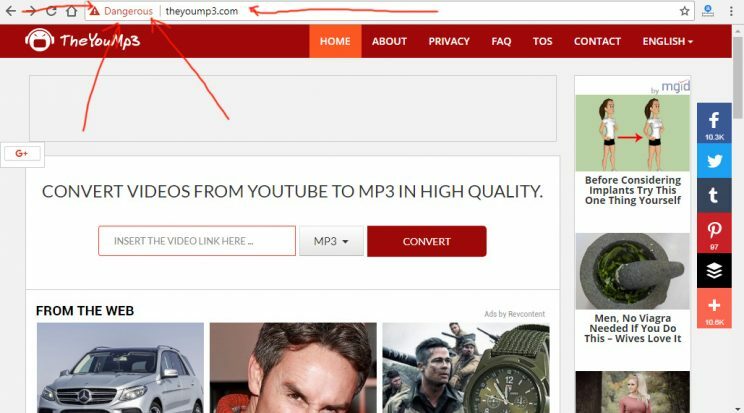 In the months since youtube-mp3.org has disappeared, TheYouMp3 has become one of the prominent players in the mp3 converters scene. And no wonder why: it did instant conversion, as opposed to most services. You see, usually audio or video is downloaded from youtube and then converted to mp3 by the server. After that you start your download. Thus the delay. Following on the report we received from Brian a few days ago, quick investigation of TheYouMp3.com was conducted and report was confirmed: TheYouMP3 doesn’t work anymore. It shows “we cannot process this link” message on any attempt we did, was it brand new youtube video, vimeo or dailymotion. Below there are several screenshots of our process.. But first, let’s announce some of the…. YoutubeMp3.Today – using 5 APIs from 5 different converters, top choice, no popups!! But before we begin, check out Alexa’s traffic report for theyoump3.com, see how it peaked recently due to all that free traffic after youtube-mp3.org went off the radar, hit the amazing heights of being top 2000 most used websites in the world… WOW! and just recently – drop in traffic, you can see it going down… Why? Maybe, because it doesn’t work anymore? It was saying to me, site is “deceptive” after I’ve tried steps 2 and 3, and decided to actually try download video instead of mp3. SO chrome went off the rails and started with its warnings of bad times ahead. But here is that, denoted with arrows… TheYouMp3 is now dangerous according to Google Chrome..
Well… this is quite a nasty blow, maybe this site will come back, cause you know, many of them go down and come back up… but in the mean time – look for alternatives to replace TheYouMp3…. Video2Mp3 – is there anything to this search group?